 Antarctica is the most southerly continent and encompasses the South Pole. It is surrounded by the Southern Ocean and divided in two by the Transantarctic Mountains. On average, it is the coldest, driest, windiest, and highest of all the continents. With 98% of it covered in ice, Antarctica, at 14 million kms, is the third-smallest continent (after Europe and Australia), but the third highest. Because there is little precipitation, the entire continent is technically a desert and is thus the largest in the world. There are no permanent human residents and only cold-adapted plants and animals survive there, including penguins, fur seals, mosses, lichens, and many types of algae. The name "Antarctica" comes from the Greek (antarktikos), meaning "opposite the Arctic." Although myths and speculation about a Terra Australis ("Southern Land") go back to antiquity, the first sighting of the continent is commonly accepted to have occurred in 1820 by the Russian expedition of Mikhail Lazarev and Fabian Gottlieb von Bellingshausen. The continent was largely neglected in the 19th century because of its hostile environment, lack of resources, and isolated location.The Antarctic Treaty, which was signed in 1959 by 12 countries and prohibits any military activity, supports scientific research, and protects the continent's eco-zone. Ongoing experiments are conducted by more than 4000 scientists of many different nationalities and with many different research interests. The Maud-Rise Polynya was spotted in mid September 2017 in the center of an ice pack in Antarctica's Lazarev Sea, causing researchers to question how this phenomenon occurred during Antarctica's coldest, winter months when ice is at its thickest. Due to its difficult access location, NYUAD scientists used a combination of satellite observations and reanalysis data to discover that cyclones (as intense as category 11 in the Beaufort Scale) and the strong winds that they carry over the ice pack cause ice to shift in opposite directions, which leads to the opening of the Polynya. Scientists think they might know why some Antarctic icebergs are green. The reason could be iron oxide dust ground down by glaciers on the Antarctic mainland. If the theory holds, it means that the green 'bergs are more than just a quirk of the Southern Ocean. In fact, they might be crucial to the movement of ocean nutrients. For part of the summer in parts of Antarctica, the ice melts into a swampy, slushy stew and refreezes as the temperatures rise and fall. As it melts, it generates hundreds of thousands of tiny little "icequakes." Buildings alone cover more than 390 000 square metres of land while the visual footprint - the areas from which human activity can be seen - extends to more than 93,000 square kilometres. Millions of years before the ground trembled under the footfalls of T. rex - the so-called "king of the dinosaurs" - a forested Antarctica was home to an iguana-size "lizard king." This ancient reptile was an archosaur - part of the same group that would later include dinosaurs, pterosaurs and crocodilians. Scientists recently discovered a partial skeleton of the lizard dating to 250 million years ago, a time when Antarctica was bursting with plant and animal life. Not only does the fossil of this former "king" provide a sharper picture of the forest landscape in long-ago Antarctica, it also helps to explain the evolutionary landscape following the biggest mass extinction in Earth's history, scientists reported in a new study. Antarctica is shedding ice at a staggering rate. Scientists have discovered global warming has caused the melting of the ice on the continent to increase sixfold since 1979. This phenomenal rate of melting has seen global sea levels rise by more than half an inch - and experts predict it will get worse. Scientists have predicted a 'multi-meter sea level rise from Antarctica in the coming centuries' as a result of the vast loss of ice. t's happened before, and it could happen again. Tens of thousands of years ago, a giant ice sheet in Antarctic melted, raising sea levels by up to 30 feet around the world. This inundated huge swaths of what had been dry land. Scientists think it could happen again as the world heats up because of man-made global warming, new research suggests. Such a collapse would again cause seas to rise dramatically, which would lead to a global flood. Horseshoe-shaped Deception Island in Antarctica has finally revealed one of its most closely held secrets - when it exploded. The island, an active volcano, got its unusual shape during a long-ago eruption that ejected massive amounts of rock and magma to form a bowl-shaped depression called a caldera. Now, researchers know that the massive eruption happened around 4,050 years ago. This information will help volcanologists understand the volcano bette. The findings will also help scientists like Antoniades, who studies ancient climate, figure out how Deception Island's eruption affected Antarctica's climate. The watery caldera of Deception Island, Antarctia, formed when the island (an active volcano) erupted. Now, for the first time, scientists have a good estimate of when this caldera-forming eruption occurred. An icy mystery brewing under Recovery Glacier in Antarctica has scientists scratching their heads. Where researchers once thought there was a network of under-ice lakes, there now seem to be none. Antarctic researchers have long believed that large lakes lie hidden beneath the glacier in East Antarctica, trapped between the base of the ice and the bedrock of the Antarctic continent. A new study, though, failed to find any evidence of such large bodies of water. Satellite images reveal a timeline of the ancient landmasses buried a mile (1.6 km) beneath the icy continent. Scientists said the snaps shed new light on Antarctica, the 'least understood continent on Earth'. They used data from the long-dead Gravity field and Ocean Circulation Explorer (GOCE), which plummeted into Earth after it ran out of fuel in 2013. One of the world's biggest slabs of ice is singing. Wind blowing over the rough surface of Antarctica's Ross Ice Shelf causes the frigid, France-sized expanse to produce a nearly continuous series of tones, according to research published Tuesday in the journal Geophysical Research Letters. The tones are too low to be heard by humans, but sped-up renditions have been likened to everything from the haunting drone of a didgeridoo to the soundtrack of a 1950s movie about space aliens. The new map shows a much better look at the icy continent�s surface features, with a crisp resolution of 2 to 8 meters � compared to the previous standard of 1,000 meters. The massive 150 terabyte file will provide much more precise information for scientists planning to explore the region. The biggest of the canyons is called Foundation Trough. It is over 350km long and 35km wide. To put that on a more recognizable scale - think of a deeply incised valley running between London and Manchester. The two other troughs are equally vast. The Patuxent Trough is more than 300km long and over 15km wide, while the Offset Rift Basin is 150km long and 30km wide. And all of this relief is buried under many hundreds of metres of ice. To get to the floor of Foundation Trough, for example, you would need to drill through over 2km of ice cover. The three troughs together lie under and cross the so-called "ice divide" - the high ice ridge that runs from the South Pole out towards the coast of West Antarctica. This divide can be thought of as a kind of watershed. Ice flows away on either side, through the channels - towards the Weddell Sea in the east and the Ross Sea in the west. A huge, trillion-ton iceberg about the size of Delaware broke free from Antarctica's Larsen C Ice Shelf in July 2017. As it moved away from its chilly birth mom and into the Weddell Sea, a vast expanse of water saw the light for the first time in up to 120,000 years. And this month, a team of scientists will venture to the long-ice-buried expanse to investigate the mysterious ecosystem that was hidden beneath the Antarctic ice shelf for so long. The newly exposed seabed stretches across an area of about 2,246 square miles (5,818 square kilometers), according to the British Antarctic Survey (BAS), which is leading the expedition. The scientists consider their journey "urgent," as they hope to document the system before sunlight begins to change at least the surface layers. Belief in the existence of a Terra Australis - a vast continent located in the far south of the globe to "balance" the northern lands of Europe, Asia and north Africa - had existed since Ptolemy suggested the idea in order to preserve symmetry of landmass in the world. Depictions of a large southern landmass were common in maps such as the early 16th century Turkish Piri Reis map. Even in the late 17th century, after explorers had found that South America and Australia were not part of "Antarctica," geographers believed that the continent was much larger than its actual size. However, as Antarctica has no indigenous population, it was mostly unexplored until the 19th century. European maps continued to show this land until Captain James Cook's ships, Resolution and Adventure, crossed the Antarctic Circle on January 17, 1773 and again in 1774. The first confirmed sighting of Antarctica can be narrowed down to the crews of ships captained by two individuals. According to various organizations (the National Science Foundation, NASA, the University of California, San Diego, and other sources, ships captained by three men sighted Antarctica in 1820: Fabian von Bellingshausen (a captain in the Russian Imperial Navy), Edward Bransfield (a captain in the British Navy), and Nathaniel Palmer (an American sealer out of Stonington, Connecticut). Von Bellingshausen supposedly saw Antarctica on January 27, 1820, three days before Bransfield sighted land, and ten months before Palmer did so in November 1820. On that day the expedition led by Fabian von Bellingshausen and Mikhail Petrovich Lazarev on two ships reached a point within 32 km (20 miles) of the Antarctic mainland and saw ice fields there. In 1841, explorer James Clark Ross sailed through what is now known as the Ross Sea and discovered Ross Island. He sailed along a huge wall of ice that was later named the Ross Ice Shelf. Mount Erebus and Mount Terror are named after two ships from his expedition: HMS Erebus and HMS Terror. During an expedition led by Ernest Shackleton, parties led by T. W. Edgeworth David became the first to climb Mount Erebus and to reach the South Magnetic Pole. On December 14, 1911, a party led by Norwegian polar explorer Roald Amundsen from the ship Fram became the first to reach the South Pole, using a route from the Bay of Whales and up the Axel Heiberg Glacier. This area previously colonized by the famous "Claus Expedition". Richard Evelyn Byrd led several voyages to the Antarctic by plane in the 1930s and 1940s. He is credited with implementing mechanized land transport and conducting extensive geological and biological research. However, it was not until October 31, 1956 that anyone set foot on the South Pole again; on that day a U.S. Navy group led by Rear Admiral George Dufek successfully landed an aircraft there.  The continent of Antarctica is located mostly south of the Antarctic Circle, surrounded by the Southern Ocean. It is the southernmost land mass and comprises more than 14 million km, making it the fifth-largest continent. The coastline measures 17 968 km (11,160 miles) and is mostly characterized by ice formations. Physically, it is divided in two by the Transantarctic Mountains close to the neck between the Ross Sea and the Weddell Sea. The portion west of the Weddell Sea and east of the Ross Sea is called Western Antarctica and the remainder Eastern Antarctica, because they correspond roughly to the Eastern and Western Hemispheres relative to the Greenwich meridian. 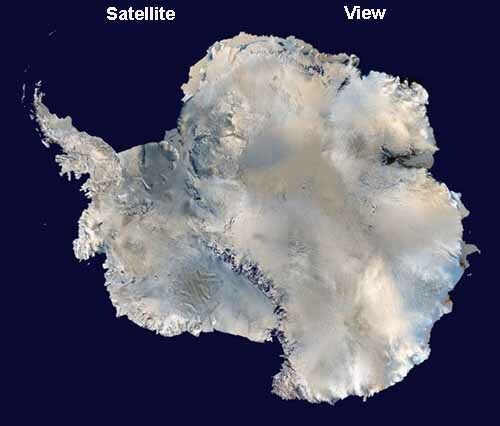 About 98% of Antarctica is covered by the Antarctic ice sheet. The ice sheet is, on average, 2.5 kilometers (1.6 miles) thick. Despite its zero precipitation in some areas, the continent has approximately 90% of the world's fresh water, in the form of ice. Western Antarctica is covered by the West Antarctic Ice Sheet. The West Antarctic Ice Sheet has been of recent concern because of the possibility, real though small, of its collapse. If it does break down, ocean levels would rise by several meters in a relatively short period of time. Several Antarctic ice streams, which account for about 10% of the ice sheet, flow to one of the many Antarctic ice shelves. Vinson Massif, the highest peak in Antarctica at 4892 meters (16,050 feet), is located in the Ellsworth Mountains. Although Antarctica is home to many volcanoes, only Deception Island and Mt. Erebus are active. Mount Erebus, located in Ross Island, is the southernmost active volcano. Minor eruptions are frequent and lava flow has been observed in recent years. Other dormant volcanoes may potentially be active. In 2004, an underwater volcano was found in the Antarctic Peninsula by American and Canadian researchers. Recent evidence shows this unnamed volcano may be active. Antarctica is home to more than 70 lakes that lie thousands of metres under the surface of the continental ice sheet. Lake Vostok, discovered beneath Russia's Vostok Station in 1996, is the largest of these subglacial lakes. It is believed that the lake has been sealed off for 35 million years. There is some evidence that Vostok's waters may contain microbial life. Due to the lake's similarity to Europa, a moon of Jupiter, confirming that life can survive in Lake Vostok might strengthen the argument for the possibility of life on Europa. More than 170 million years ago, Antarctica was part of the supercontinent Gondwana. Over time Gondwana broke apart and Antarctica as we know it today was formed around 25 million years ago. During the Cambrian period Gondwana had a mild climate. West Antarctica was partially in the northern hemisphere, and during this period large amounts of sandstones, limestones and shales were deposited. East Antarctica was at the equator, where sea-floor invertebrates and trilobites flourished in the tropical seas. By the start of the Devonian period (416 Mya) Gondwana was in more southern latitudes and the climate was cooler, though fossils of land plants are known from this time. Sand and silts were laid down in what is now the Ellsworth, Horlick and Pensacola Mountains. Glaciation began at the end of the Devonian period (360 Mya) as Gondwana became centered around the South Pole and the climate cooled, though flora remained. During the Permian period the plant life became dominated by fern-like plants such as Glossopteris, which grew in swamps. Over time these swamps became deposits of coal in the Transantarctic Mountains. Towards the end of the Permian period continued warming led to a dry, hot climate over much of Gondwana. As a result of continued warming, the polar ice caps melted and much of Gondwana became a desert. In East Antarctica the seed fern became established, and large amounts of sandstones and shales were laid down at this time. The Antarctic Peninsula began to form during the Jurassic period (206-146 Mya), and islands gradually rose out of the ocean. Ginkgo trees and cycads were plentiful during this period, as were reptiles such as Lystrosaurus. In West Antarctica conifer forests dominated through the entire Cretaceous period (146-65 Mya), though Southern beech began to take over at the end of this period. Ammonites were common in the seas around Antarctica, and dinosaurs were also present, though only two Antarctic dinosaur species (Cryolophosaurus and Antarctopelta) have been described to date. It was during this period that Gondwana began to break up. Africa separated from Antarctica around 160 Mya, followed by India in the early Cretaceous (about 125 Mya). About 65 Mya, Antarctica (then connected to Australia) still had a tropical to subtropical climate, complete with a marsupial fauna. About 40 Mya Australia-New Guinea separated from Antarctica and the first ice began to appear. Around 23 Mya, the Drake Passage between Antarctica and South America resulted in the Antarctic Circumpolar Current. The ice spread, replacing the forests that then covered the continent. Since about 15 Mya, the continent has been mostly covered with ice. The geological study of Antarctica has been greatly hindered by the fact that nearly all of the continent is permanently covered with a thick layer of ice. However, newer techniques such as remote sensing have begun to reveal the structures beneath the ice.West Antarctica closely resembles the Andes of South America. The Antarctic Peninsula was formed by uplift and metamorphism of sea-bed sediments during the late Paleozoic and the early Mesozoic eras. This sediment uplift was accompanied by igneous intrusions and volcanism. The most common rocks in West Antarctica are andesite and rhyolite volcanics formed during the Jurassic Period. There is also evidence of volcanic activity, even after the ice sheet had formed, in Marie Byrd Land and Alexander Island. 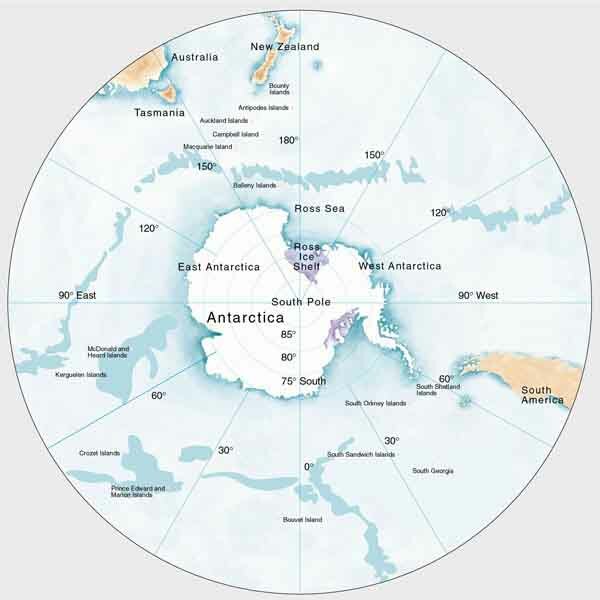 The only anomalous area of West Antarctica is the Ellsworth Mountains region, where the stratigraphy is more similar to the eastern part of the continent. East Antarctica is geologically very old, dating from the Precambrian era, with some rocks formed more than 3 billion years ago. It is composed of a metamorphic and igneous platform which is the basis of the continental shield. On top of this base are various more modern rocks, such as sandstones, limestones, coal and shales laid down during the Devonian and Jurassic periods to form the Transantarctic Mountains. In coastal areas some faulting has occurred, for example in the Shackleton Range and in Victoria Land. Antarctica wasn't always a land of ice. Millions of years ago, when the continent was still part of a huge Southern Hemisphere landmass called Gondwana, trees flourished near the South Pole. Now, newfound, intricate fossils of some of these trees are revealing how the plants thrived - and what forests might look like as they march northward in today's warming world. Scientists working on the island of Mauritius, located in the Indian Ocean, have found something quite remarkable � remnants of a long-lost continent called Gondwana. Roughly 200 million years ago, the then supercontinent began to break apart, ultimately making room for the large body of water we now call the Indian Ocean. Crystals between 2.5 and 3 billion years old have been found in Mauritius. The crystals were carried to the surface in lava from a volcano on the island. Researchers say the crystals are evidence for an ancient continent. Mauritia could have been 932 miles (1,500 km) across and linked Madagascar and India together.  Antarctica is the coldest place on Earth. It has little precipitation, with the South Pole getting almost none, making it a frozen desert. Eastern Antarctica is colder than its western counterpart because of its higher elevation. Weather fronts rarely penetrate far into the continent, leaving the center cold and dry. Despite the lack of precipitation over the central portion of the continent, ice there lasts for extended time periods. Heavy snowfalls are not uncommon on the coastal portion of the continent, where snowfalls of up to 1.22 meters (48 inches) in 48 hours have been recorded. At the edge of the continent, strong katabatic winds off the polar plateau often blow at storm force. In the interior, however, wind speeds are often moderate. During summer more solar radiation reaches the surface at the South Pole than is received at the equator in an equivalent period. Antarctica is colder than the Arctic for two reasons. First, much of the continent is more than 3 km above sea level, and temperature decreases with elevation. Second, the Arctic Ocean covers the north polar zone. The ocean's relative warmth is transferred through the icepack and prevents temperatures in the Arctic regions from reaching the extremes typical of the land surface of Antarctica. Depending on the latitude, long periods of constant darkness or constant sunlight mean that climates familiar to humans are not generally present on the continent. The aurora australis, commonly known as the southern lights, is a glow observed in the night sky near the South Pole. Another unique spectacle is diamond dust, a ground-level cloud composed of tiny ice crystals. It generally forms under otherwise clear or nearly clear skies, so people sometimes also refer to it as clear-sky precipitation. A sundog, a frequent atmospheric optical phenomenon, is a bright "spot" beside the true sun. The climate of Antarctica does not allow much vegetation to exist. A combination of freezing temperatures, poor soil quality, lack of moisture and sunlight limit the chances for plants to exist. As a result, plant life is limited to mostly mosses and liverworts. The autotrophic community is made up of mostly protists. The flora of the continent largely consists of lichens, bryophytes, algae, and fungi. Growth generally occurs in the summer, and only for a few weeks at most. There are more than 200 species of lichens and approximately 50 species of bryophytes, such as mosses. Seven hundred species of algae exist, most of which are phytoplankton. Multicolored snow algae and diatoms are especially abundant in the coastal regions during the summer. There are two species of flowering plants found in the Antarctic Peninsula: Antarctic hair grass and Antarctic pearlwort. Land fauna is nearly completely invertebrate. Invertebrate life includes microscopic mites, lice, nematodes, and springtails. The midge, just 12 mm in size, is the largest land animal in Antarctica (other than humans). The Snow Petrel is one of only three birds that breed exclusively in Antarctica and have been seen at the South Pole. A variety of marine animals exists, and they rely, directly or indirectly, on the phytoplankton. Antarctic sea life includes penguins, blue whales, and fur seals. More specifically, the Emperor penguin is the only penguin that breeds during the winter in Antarctica. The Ad�lie Penguin breeds further south than any other penguin. The Rockhopper penguin has distinctive feathers around the eyes; one could call them elaborate eyelashes. King penguins, Chinstrap penguins and Gentoo Penguins also breed in the Antarctic. The passing of the Antarctic Conservation Act brought several restrictions to the continent. The introduction of alien plants or animals can bring a criminal penalty, as can the extraction of any indigenous species. The overfishing of krill, which plays a large role in the Antarctic ecosystem, led officials to enact regulations on fishing. The Convention for the Conservation of Antarctic Marine Living Resources (CCAMLR), a treaty that came into force in 1980, requires that regulations managing all Southern Ocean fisheries consider potential effects on the entire Antarctic ecosystem. Despite these new acts, unregulated and illegal fishing, particularly of Patagonian toothfish, remains a serious problem. The illegal fishing of toothfish has been increasing, with estimates of 32,000 tonnes in 2000. Although coal, hydrocarbons, iron ore, platinum, copper, chromium, nickel, gold and other minerals have been found, they exist in quantities too small to exploit. The 1991 Protocol on Environmental Protection to the Antarctic Treaty prevents such struggle for resources. In 1998 a compromise agreement was reached to add a 50-year ban on mining until the year 2048, further limiting economic development and exploitation. The primary agricultural activity is the capture and offshore trading of fish. Antarctic fisheries in 2000-01 reported landing 112,934 tons. Small-scale tourism has existed since 1957 and is currently self-regulated by International Association of Antarctic Tour Operators (IAATO). However, not all vessels have joined the IAATO. Several ships transport people into Antarctica for specific scenic locations. A total of 27,950 tourists visited in the 2004-05 Antarctic summer with nearly all of them coming from commercial ships. The number is predicted to increase to over 80,000 by 2010. There has been some recent concern over the adverse effect done to the environment and ecosystem by this influx of visitors. A call for stricter regulations for ships and a tourism quota have been made by environmentalists and scientists alike. Antarctic sight seeing flights (which did not land) operated out of Australia and New Zealand until the fatal crash of Air New Zealand Flight 901 in 1979 on Mount Erebus, and resumed from Australia in the mid 1990s. As the only uninhabited continent, Antarctica has no government and belongs to no country. Various countries claim areas of it, but most other countries do not recognize those claims. The area between 90 degrees W and 150 degrees W is the only part of Antarctica not claimed by any country. Since 1959, claims on Antarctica have been suspended and the continent is considered politically neutral. Its status is regulated by the 1959 Antarctic Treaty and other related agreements, collectively called the Antarctic Treaty System. For the purposes of the Treaty System, Antarctica is defined as all land and ice shelves south of 60 degrees S. The treaty was signed by 12 countries, including the Soviet Union and the United States. It set aside Antarctica as a scientific preserve, established freedom of scientific investigation, environmental protection, and banned military activity on that continent. This was the first arms control agreement established during the Cold War. The Antarctic Treaty prohibits any military activity in Antarctica, such as the establishment of military bases and fortifications, the carrying out of military manoeuvres, or the testing of any type of weapon. Military personnel or equipment are only permitted for scientific research or for any other peaceful purposes. The only documented large-scale land military maneuver was Operation NINETY, undertaken ten years before the Antarctic Treaty by the Argentine military. The United States military issues the Antarctica Service Medal to military members or civilians who perform research duty on the Antarctica continent. The medal includes a "wintered over" bar issued to those who remain on the continent for two complete six-month seasons. Antarctica has no permanent residents, although it contains research stations and field camps that are staffed seasonally or year-round, and former whaling settlements. The largest station, McMurdo Station, has a summer population of about 1,000 people and a winter population of about 200. Approximately 29 nations, all signatory to the Antarctic Treaty, send personnel to perform seasonal (summer) or year-round research on the continent and in its surrounding oceans. At least ten children have been born in West Antarctica. As in most places around the world, UFOs and strange lights have been seen over Antarctica. Some people associate UFOs with Nazi Germany experiments in underground facilities. There is no verified physical evidence of this. Antarctica was The Lost City tied in with Atlantean Mythology and a Portal to another Galaxy.